An innovative adapter-mounted ball bearing system has transformed the economics of maintaining Sapphire Energy Recovery’s tyre shredding machines. Switching to the Dodge Grip Tight bearing, which features a flinger seal and a built-in mechanism for removing the bearing from the shaft, has completely resolved a recurrent and expensive repair problem. 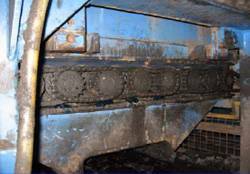 Sapphire Energy Recovery operates high-throughput shredding machines in four major conurbations throughout the UK, providing a sustainable solution for end of life car and van tyres by processing them into chips. These chips are then used as an alternative to coal in cement manufacture. After shredding, the tyre chips are graded for size by a classifier with 36 sets of bearings. 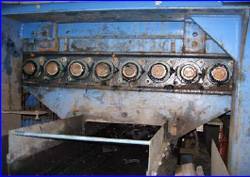 The classifier shafts’ setscrew style bearings were being damaged, by both the fine metal wires in the tyres, and the water used for cooling. As a result they had a life, typically, of less than 6 months. Changing the classifier bearings could then take anything up to two hours per bearing, depending on the problems encountered and the skill of the operators. Corrosion sometimes meant that the bearings needed to be loosened by heat, for example, and in some cases the whole shaft had to be replaced. Sapphire is the UK’s leading end of life car and van tyre processor, and its processing centres often operate for 24 hours a day. Addressing the planned and emergency maintenance requirements of these machines became a priority for Sapphire’s Reliability Manager Andy Booth, and he called in the specialist Dodge distributor, Bearing Transmission & Pneumatics, to discuss the problem. Bearing Transmission & Pneumatics suggested that Sapphire try a type of ball bearing from Baldor’s range called the Dodge Grip Tight. 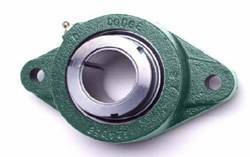 This adapter-style bearing has a mechanical maintenance feature that loosens it by simply turning a nut. The action automatically pulls the bearing off, avoiding any need for forcible removal or expansion heating, eliminating fretting corrosion and preventing shaft damage. The bearings were a little more expensive more than the set screw type that Sapphire had been using, but demonstrations and examples of field experience in the most hostile conditions convinced Andy Booth that the easy off mechanism would make changeovers a predictable operation. Sapphire purchased some Grip Tight bearings and installed them as and when the previous bearings failed. Although predictable maintenance was Andy Booth’s major requirement, it soon became obvious that the bearings offered a superior life too, as the life period came and went. The Grip Tight’s built-in flinger seal is protecting the bearings in the hostile environment to such as en extent that they are lasting typically twice as long as the previous set screw types. Now, following the use of Grip Tight over a period of some 24 months, and a number of maintenance changeovers, Andy Booth knows that the Grip Tight justifies its reputation: changeovers are predictable and take only 15 minutes maximum following production operator training including the time required to remove and refit machine casings. Moreover, there has been no shaft damage to date. Sapphire Energy Recovery provides a sustainable solution to the tyre disposal problem – the inherent energy in the tyres is used to provide heat as part of the cement making process with the tyre’s steel properties absorbed into the cement. The tyres are effectively fully consumed during the energy recovery process and there is no waste. The company was formed by Lafarge Cement UK and Michelin Tyre PLC as a joint venture, to recover and process end-of-life tyres for use as cement kiln fuel. Since its inception in early 2001, the company has grown to become the UK’s leading end of life car and van tyre processor.